MusicBrainz Picard is a free and open source music tagging software developed by the MetaBrainz Foundation, a non-profit company that also operates the MusicBrainz database, an open music encyclopedia. The application can use your local music tags and acoustic fingerprints (AcoustID) to automatically compare it to records in the MusicBrainz database. When a match is found, MusicBrainz Picard can update the tags of your local music with metadata from their database, like the artist, album, track name, album cover, and so on. The application can also tag audio files based on filenames. What's more, MusicBrainz Picard's functionality can be extended through scripts and plugins. MusicBrainz Picard 2.0 was ported to Python 3 (requires at least version 3.5) and PyQt5 (>= 5.7). The release announcement mentions that a side effect of this is that "Picard should look better and in general feel more responsive". Also, many encoding-related bugs were fixed with the transition to Python 3, like the major issue of not supporting non-UTF8 filenames. The MusicBrainz Picard 2.0 changelog is available here. With this release, the developers decided to no longer support Windows 32bit due to lack of resources. Also, the macOS requirements were also increased to macOS 10.10 or newer. If you need help on how to use MusicBrainz Picard to tag your music files, see its documentation. For Linux you'll find MusicBrainz Picard binaries for Arch Linux, Debian, Fedora, Gentoo, openSUSE and Ubuntu, as well as a generic Flatpak. Not all the binaries were updated to the latest Picard 2.0 though. The Flatpak for example is still using version 1.4.2. 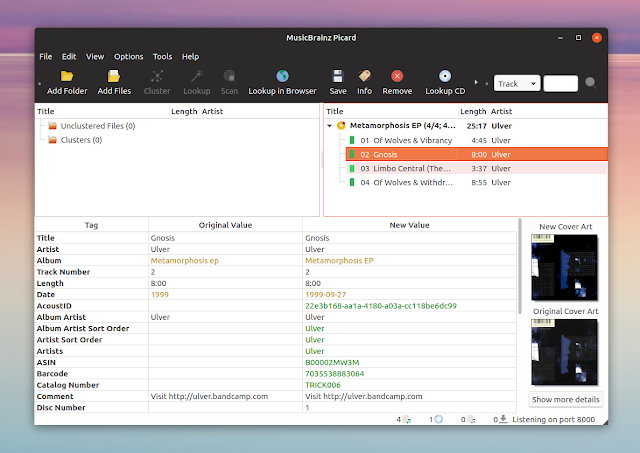 The Ubuntu PPA already includes MusicBrainz Picard 2.0, for Ubuntu 18.10, 18.04 (and Linux Mint 19), and 17.10.